Setup: 7 Twists. Each Twist is a Dark Portal. 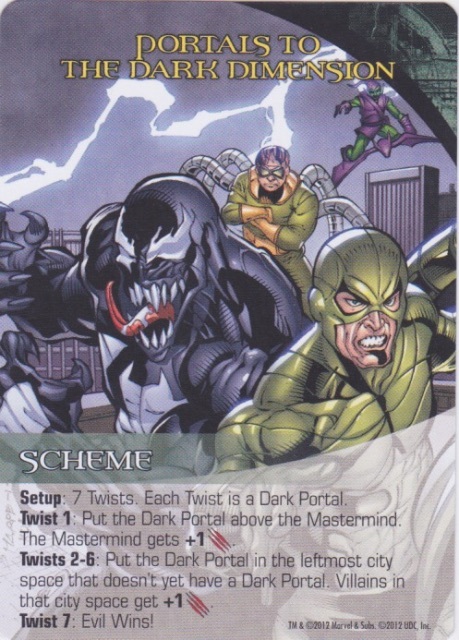 Twist 1: Put the Dark Portal above the Mastermind. The Mastermind gets +1 Attack. Twists 2-6: Put the Dark Portal in the leftmost city space that doesn't yet have a Dark Portal. Villians in that city space get +1 Attack. Setup: 5 twists. 3 additional Twists next to this Scheme. 18 Total Bystanders in the Villian Deck. 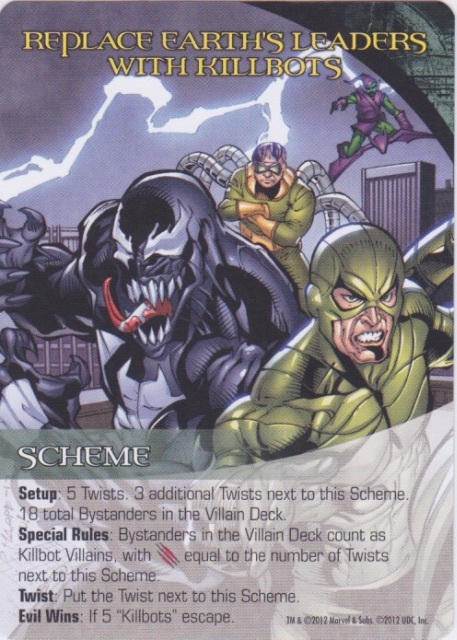 Special Rules: Bystanders in the Villain Deck count as Killbot Villains, with Attack equal to the number of Twists next to this Scheme. Twist: Put the Twist next to this Scheme. Evil Wins: If 5 "Killbots" escape. Setup: 8 Twists, 6 Heros. Skrull Villain Group Required. Shuffle 12 random Heros from the Hero Deck into the Villain Deck. Special Rules: Heros in the Villain Deck count as Skrull Villains with Attack equal to the Hero's Cost+2. If you defeat that hero, you gain it. Twist: The highest-cost hero from the HQ moves into the Sewers as a Skrull Villain, as above. Evil Wins: If 6 Heroes get into the Escaped Villains Pile.